1. Steph Curry – OVR 96 (-1) – The Warriors have lost the last 2 out of 3 home games and Steph hasn’t been as hot. But he’s still the best player in basketball. 2. 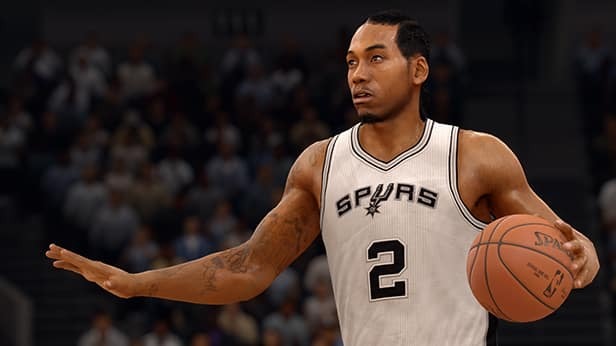 Kawhi Leonard – OVR 95 (no change) – Kawhi looks to keep up his consistent high level of play as the Spurs head into the playoffs. 3. DeMarcus Cousins – OVR 94 (+1) – He returned from rest and a suspension and dropped 30 points and grabbed 9 rebounds. Boogie is still the best big man in the league. 4. Russell Westbrook – OVR 93 (no change) – Westbrook now has 17 triple-doubles on the season, tying Magic Johnson’s record. 5. LeBron James – OVR 92 (-1) – Turnovers have been a bit of an issue for King James heading into the playoffs. At 92 OVR, Chris Paul gets an honorable mention with J.J. Barea seeing the most improvement this time around. The Western Conference player of the week has really shown out in the past 10 games, averaging 18.5 points and 5.4 assists per game.